OVER 200 RENTAL FORMS THAT WILL MAKE YOU MORE MONEY AND HELP YOU TAKE CONTROL OF EVERY RENTAL SITUATION! The single most ant activity of a rental owner is what you communicate to residents. With these forms, now you can take total control of every rental situation, generate more monthly cash flow, have less headaches. All it takes is using the right forms that are included in this special offer. Receive this LATEST version of the Handbook of Rental Forms which is updated annually. 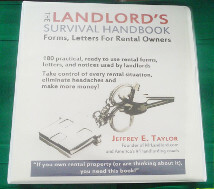 The tenth edition of this handbook now includes a complete sample rental agreement and all the forms that incorporate the classic money making programs Jeffrey Taylor, editor of MRLANDLORD.com shares at seminars. Jeffrey Taylor is a master communicator, one of the most successful and internationally known real estate instructors, founder of MrLandlord.com (home of the most circulated newsletter for rental owners for thirty years and most visited Q & A Forum for landlords on the Internet). These are the forms that Jeffrey (and tens of thousands of subscribers) personally uses with his residents. Do you need a specific form RIGHT NOW? We know that landlords sometimes just need one particular form that is specifically written for their state. And often they need it immediately (i.e., application, lease, move-in checklist, notice to pay or quit). So we have partnered up with a top legal publishing firm to provide various "state-specific" rental forms drafted by attorneys. Review all forms available and click here if you need just need one state-specific form that you can order and download immediately. 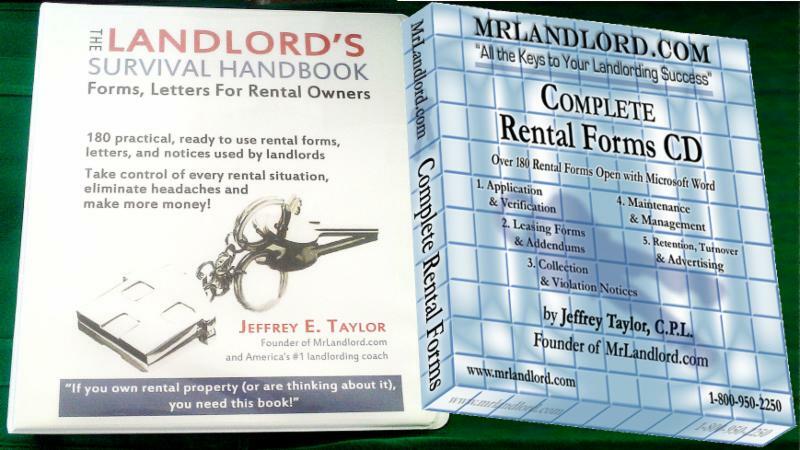 To obtain the complete set of MrLandlord.com's 200 form, click now to add this set your shopping cart. When you purchase this handbook, you will also receive a free copy of the ninth edition of the book LANDLORDING, which includes over 60 more landlording and management forms for do-it-yourself landlords. If you want this complete, updated and expanded handbook of 200 forms in the binder PLUS the forms on CD, you may want to take a look at item S3 suggested below, which is the special TWO-FOR ONE offer! If you just want the expanded handbook of updated forms (and bonus Landlording book), without the Forms CD , click now.